UPDATE 46, Saturday 10:25 a.m. EST: Omar Suleiman, the head of Egyptian intelligence, has been sworn in as Egypt’s first Vice President in 30 years. Think tanker Andrew Exum warns “this will solve nothing.” And Foreign Policy‘s Marc Lynch makes the somewhat counterintuitive argument that Obama has actually been handling the Egypt crisis pretty well. UPDATE 47, Saturday 10:30 a.m. EST: Andrew Exum has a great list of “people who might actually know what the &*^& they’re talking about” with regards to Egypt. Also, if you’re not watching Al Jazeera English’s live feed, you should be. UPDATE 48, Saturday 10:40 a.m. EST/5:40 p.m. Cairo: Al Jazeera has two important updates: Protesters are trying to storm the Interior Ministry again, despite being repelled (with loss of life) earlier today; and (via Sultan Al Qassemi) Gamal and Alaa Mubarak, Mubarak’s sons, have arrived in London with their families. UPDATE 62, Saturday 5:30 p.m. EST: It’s Sunday already in Cairo, but tens of thousands of protesters are still in the streets. Al Jazeera is reporting that 19 private jets carrying top Egyptian businessmen and their families have just departed from Cairo. And the New York Times just published a story datelined from the World Economic Forum in Davos, Switzerland: “Arab Executives Predict Regime Change in Egypt.” I’ll have my own report on the Egypt talk in Davos shortly. UPDATE 63, Saturday 5:40 p.m. EST: Two reports of note: Al Arabiya says 5000 prisoners have escaped from Fayoum prison. Mohamed El-Batran, the top general at the prison, has reportedly been killed. Also, there are multiple reports of a sniper firing live ammunition from the top of the Ministry of Information building in central Cairo. I spoke to a private banker from Bahrain (who was also talking to [New York Times columnist] Tom Friedman) and he said the big picture is that almost everybody thinks Mubarak is gone, but the question is, is it a week, a month, or six months. Then the question becomes, there have never really been campaigns in Egypt or organized parties. What happens when you have the Muslim Brotherhood, the communists? No one really knows what the people really want, because [they’ve never had free elections before]. Al Jazeera sees this as an act designed to stifle and repress the freedom of reporting by the network and its journalists. In this time of deep turmoil and unrest in Egyptian society it is imperative that voices from all sides be heard; the closing of our bureau by the Egyptian government is aimed at censoring and silencing the voices of the Egyptian people. Al Jazeera assures its audiences in Egypt and across the world that it will continue its in-depth and comprehensive reporting on the events unfolding in Egypt. UPDATE 75, Sunday 10:05 a.m. EST/5:05 p.m. Cairo: As suggested in Update 70 and 71, Al Jazeera is continuing its great reporting from Egypt despite an official ban. In other important news, the Muslim Brotherhood and other opposition groups have backed Mohamed ElBaradei, the former head of the International Atomic Energy Agency (IAEA) (and an Egyptian Nobel laureate) as their lead negotiator with the regime. UPDATE 79, Sunday 11:05 a.m. EST: Haaretz and Al Jazeera report that ElBaradei plans to announce the formation of an alternative unity opposition government. Now more than ever, there’s no more one-stop shopping for news. With massive lay-offs, shrinking budgets, and mismanagement for years at CBS News, ABC News, and CNN, it’s now up to the viewer to figure out the context, background, truth behind and within each story. Fox News, which has not been terribly bullish on the Egyptian revolution, at least always lets viewers know the political leaning of each talking head. 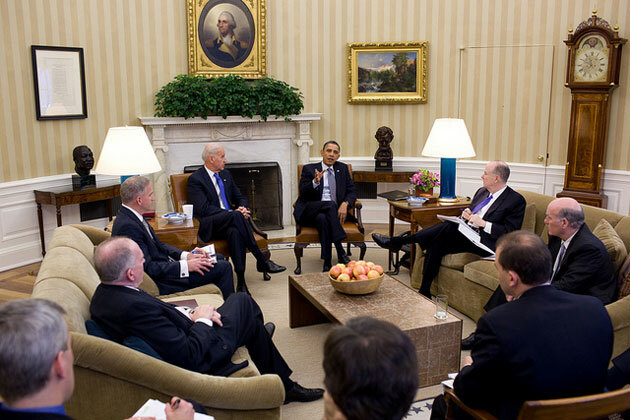 Does it not make a stronger statement to see the Mother Jones photo of Obama’s “white guy” White House briefing on Egypt when you know their progressive roots? While CNN has had great video and, as I’ve said, has a couple of the best on-the-scene reporters in Ben Wedeman and Nic Robertson, it was bothersome to learn their really smart pundit, who was critical of Obama’s lack of action, is a staunch Republican who served eight years at the U.N., appointed by George W. Bush. So now, each time I see or hear someone or something really smart, I know to check online for more context. And, throughout the day, I been checking in with Mother Jones. The work produced for “up-to-the-minute guide to the uprising,” by its eight-person D.C. bureau headed by Nick Baumann, has been extraordinary. If you want to know what’s going on in Egypt at any time, it’s all collected there. If you’re lost in the story, just read from the top down. It’s now day 6, Nic Roberts has just reported that the protesters in the street have a new gripe: they are now angry at the U.S. for propping up Mubarak to implement American policies in the region. He reports, they now want a change in that as well. Will anyone be asking now if the “regime change” we instigated nearly a decade ago, wasn’t in the wrong country. And why were we so blind to the people who really hungered for democracy, where it had a real chance to take root? Okay, I know creating democratic footholds in the that region is far more complicated than my simple questions suggest. But as we begin to unravel the new mysteries of the Middle East, will anyone in the American media dare say a clue to some of our dilemas and difficulties lies in that White House briefing photo?